NHS Blood and Transplant is encouraging people across the different faiths in the UK to talk about organ donation during Interfaith Week. Interfaith Week takes place between 12-19 November and aims to strengthen good inter faith relations, increase awareness of the different and distinct faith communities in the UK and to increase understanding between people of religious and non-religious beliefs. Engaging with, and involving, faith communities is important, as someone’s faith can play a role in their decision whether or not to donate their organs. 1 in 50 adults in England surveyed by NHS Blood and Transplant said that they thought organ donation was against their culture, religion or faith. This proportion increased to 1 in 10 people surveyed from black or Asian communities. 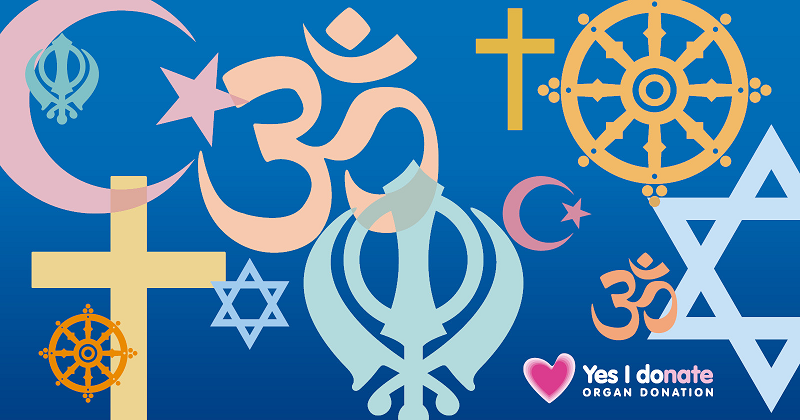 NHS Blood and Transplant is committed to working with the various faith communities to increase understanding of organ donation. For example, we provide faith specific materials to support organ donation events taking place within faith communities, have faith information on our website, are working to provide education and information to hospital chaplains, have included faith information within our education resources for secondary school students and work with our specialist nurses in organ donation to ensure understanding of the religious and cultural aspects of organ donation. Faith leaders play an important role too, and NHS Blood and Transplant encourages them to become ambassadors within their community about organ donation, to support campaigns about organ donation and to help dispel misconceptions about organ donation. Angela Ditchfield, Diversity Lead Nurse for organ donation at NHS Blood and Transplant says: “All the major religions in the UK support the idea of organ donation and transplantation but we understand that religious beliefs can play a major role in an individual’s decision to donate organs. We want to strengthen our ties with the leading faith groups in the UK to raise awareness of the importance of organ donation, particularly within Black and Asian communities. Working together we can ensure that more lives are saved through people donating their organs to help someone else in need. Read the Faith Engagement and Organ Donation Action Plan (PDF) published in 2013.